The process of requesting documents from the government, though enshrined in Australian law, can be difficult for many people - taking significant time, causing significant frustration and resulting in inconsistent and substandard outcomes - as I found when asking government agencies some simple question about which public social media channels they operated and which web browsers they used. My experience saw 25% of agencies requested never respond to the request, several more withhold information on the web browsers they used as 'commercial in confidence' (although this information is automatically transmitted to every website visited by their staff) and several others ask for up to $800 for finding the documents that provided the answer. In many cases there was little or no information on the FOI process on agency websites and in many cases agency FOI staff contacted me to explain their FOI processes (which differed substantially amongst agencies) - adding significant cost to a process where this information could be more clearly publicly explained through agency websites. This is, of course, a single example and doesn't represent the bulk of FOI requests - for which there's no consolidated statistical data on whether the system works well and the satisfaction of people making requests (as agencies don't assess this or aggregate this information - as they do for most other customer service processes), making it very hard to quantify how effectively the FOI system is performing other than via anecdotal views, such as mine above. OpenAustralia has now launched a website designed to simplify the FOI process for ordinary people, making it easier for Australians to understand what they request from which government agencies and the process of making and completing these requests, as well as collecting information on the complexities and difficulties of these processes. 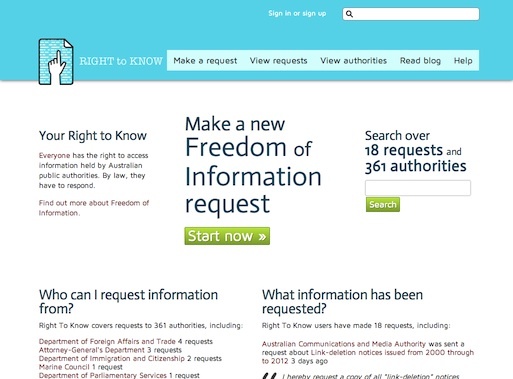 The website, Right to Know, is based on a UK model which has been in operation for a number of years and offers both better transparency in the FOI process as well as potentially streamlining the process for government agencies, where they will have to spend less of their valuable FOI officer time on explaining how to make valid FOI requests. The site will also help capture released documents and collect data on the complexity and issues with FOI processes, helping the government to improve them in the future. The site is launching at a time when the government is reviewing the operations of the revised FOI Act, and it will also be interesting to see what this review recommends - and what is ultimately done with these recommendations. I'm hopeful that the government and public service will look on the launch of Right to Know as a positive step that supports the goals of FOI, rather than considering it as yet another impost on their operations, even if long-term FOI stalwards such as Allan Rose believe that the culture change necessary in the public service to support FOI are yet to occur. we are here for your services, we gives the unique & best logo design with cheapest rates..